UPDATE: unfortunately Doug was not elected as the North Central regional director, but Susan Meadows was and we sincerely are grateful for all the dedicated people on the SWCS Board of Directors. Many thanks to your hard efforts and time. On behalf of Soil and Water Conservation Society, Jim Gulliford (swcs@swcs.org) invites you to vote in the SWCS BOD North Central Region Representative Election 2016. This election runs until 22 Feb 2016 19:00. You should receive an email from SWCS with a personal link to ElectionBuddy.com. Read about our Ontario candidate and let’s hope we have someone from Ontario representing SWCS! 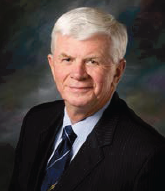 Doug Thompson retired after serving 31 years as a municipal politician in 2014. These years were spent representing rural areas in Canada’s capital region. During his political career, Doug had the honor of being chair of two important rural oriented organizations: The Rural Ontario Municipal Association and The City of Ottawa Agriculture and Rural Affairs Committee. Additionally, he was appointed to Canadian Federal Government and Province of Ontario Committees. Doug’s political career has granted him the opportunity to attend a wide variety of conferences across North America with several opportunities to present (Canada; the United States; and twice in China). It is the combination of being part of, and working with, professional colleagues that has allowed him to gain important information on conservation practices. As a North Central Region Director, I would bring representation from Ontario specifically, and Canada to the Soil and Water Conservation Society (SWCS). Over the past 31 years I have been actively involved in municipal politics and conservation across the province of Ontario. It has become clear to me that the importance of soil and water conservation practices are not a high priority in our country. I am excited about the prospect of working with the SWCS Board to bring their expertise into Canada. Over the years, I have attended SWCS conventions in the United States and have always been impressed by the wealth of knowledge provided for the attendees. Currently, I am a member of Conservation Ontario, a body that represents all 36 conservation authorities in Ontario. This organization would be an excellent avenue to integrate the SWCS work into our province. As well, being a Director would give me the opportunity to bring reports to the Board on relevant topics regarding soil/water conservation events in Canada. I would be very interested in working to facilitate future SWCS seminars and/or conferences in Ontario. I look forward, if elected, to use my experience, knowledge, and professional contacts to support the great work being done by SWCS. 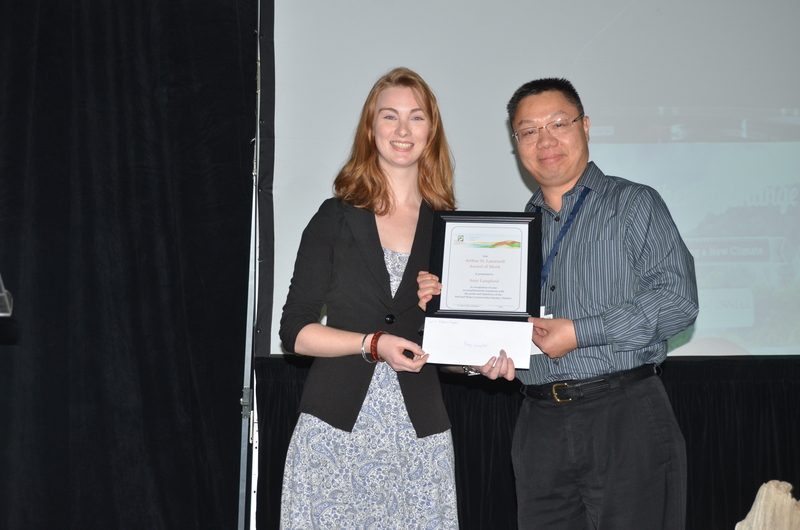 Amy Langford received the SWCS Ontario’s 2015 award of merit from Prof. Wanhong Yang 19 November 2015 in Alliston. Congratulations to Amy Langford, a 4th year University of Guelph Environmental Engineering student, for being the recipient of SWCS Ontario’s Arthur D. Latornell Award of Merit. We are very pleased to award this important award to such a deserving person. Prof. Wanhong Yang presented the award prize and certificate at the 2015 A. D. Latornell Conference in Alliston on 17 November. Prof. Yang is SWCS Ontario’s representative to the conference organizing committee. Amy is very committed to water management in Ontario. Amy revived the University of Guelph Student Chapters for the Water Environment Association of Ontario (WEAO) and the Ontario Water Works Association (OWWA). Amy is currently leading a team of executive student chapter members to grow the membership of the University of Guelph student population. The Guelph Chapters’ goal is to facilitate the knowledge transfer from seasoned professionals in the water and wastewater industry to students interested in water conservation. Part of the activities include organizing events, plant tours and inviting industry guest speakers to increase awareness of water/wastewater issues and treatment methods while emphasizing the need to protect Ontario source water. Amy’s most recent co-op position was at the Ontario Ministry of Agriculture, Food, and Rural Affairs in the Environmental Management Branch in Guelph. Her work included gathering expert knowledge on Ontario’s phosphorus sources inventory and increase awareness of the need to quantify agricultural phosphorus flows. She presented the preliminary results of the project to quantify Ontario’s phosphorus inventory at the Grey to Green Conference at Ryerson University (June 2015). Amy also developed a visual representation of energy, water and composting resources of a farm with an interactive Google Earth model. In addition to describing her professional and volunteer activities for the Award application, Amy also completed two brief, thoughtful essays about her education and her ideas about soil and water conservation. On November 17th and 19th, you are Invited to Watch Five Latornell Conservation Symposium Sessions LIVE Online that explore the connections between human and ecological health. Healthy ecosystems are essential for human health and survival. We all depend on clean air to breathe, clean water to drink, healthy food supplies, green spaces for recreation, and contact with wildlife to enrich our lives. The 2015 Latornell Conservation Symposium and EcoHealth Ontario are featuring five special sessions exploring human – ecology connections. Deadline to Register for one or more sessions: Friday, November 13, 2015. Participants need to register for each session individually. Links are provided below along with descriptions of the sessions. This session will look at the connections between watershed ecosystems and human health in order to plan and deliver programs that recognize the connection between both. The session will look at flooding from a public health perspective, as well as explore a new tool to use indicators and GIS in order to develop management and restoration strategies that support human health. This session will look at ways to increase our adaptive capacity to address the impacts of climate change on people. It will look specifically at techniques and tools used by public health units as well as specifically address issues around urban heat islands. This session will review new research that explores the relationship between climate change and rural populations as well as review practices and tools that can be used to build greater resiliency in rural communities for the benefit of residents. Humans are fundamentally dependant on ecosystems for survival, yet our awareness and understanding of this crucial connection is fragmented. Current and future challenges due to the decline of rural and urban ecosystems require proactive leadership and engagement from across the spectrum including public health, planning, environmental and urban design professionals. This first session looks at new research that clearly demonstrates the connections between green space and human health and the basis for positive change. Building on the growing research linking our health and wellbeing to the natural environment (as demonstrated in Part 1), this session explores the practice of ecohealth. The panel will provide a wide range of perspectives on the challenges and opportunities that agencies face in putting the science into practice and what new initiatives are being developed. Please download the 2015 Latornell Conservation Symposium Program for speaker information. The SWCS Nominations Committee is currently looking for recommendations from SWCS members and chapters for qualified nominees to run for the regional board director positions available in the Southeast, Southwest, and North Central regions. All candidate recommendations must be received by November 18, 2015. A list of states and provinces within these regions can be found here. The roles and responsibilities of the regional director can be found here. Please contact Tom Prout, your regional nominations committee representative for further information, your recommendations, or if you have additional questions. Do you know of an aspiring student in conservation? Would they benefit from the assistance and networking opportunity provided by the Arthur D. Latornell Award of Merit? Please pass along this website and the application for the 2015 A.D. Latornell Award of Merit to these students. This award was founded and is awarded annually by the Ontario Chapter of SWCS. The A.D. Latornell Award of Merit Program recognizes and celebrates Art’s commitment and service to our Society and Ontario. Art was involved in virtually every aspect of resources conservation during his lifetime and was a role model for many beginning a career in conservation. This Award also provides significant publicity for the Chapter and helps promote the mission of the Society. Students enrolled in college, Bachelor’s or Master’s programs in natural resources sciences and management are eligible. Ph.D. students are not eligible. There have been award winners from a wide range of disciplines in the past. Consider promoting to worthy students you have hired in the past. Due date to receive applications is September 21, 2015. The award winners are announced at the A.D. Latornell Conservation Symposium in Alliston, Tuesday November 17, 2015. Award winners are provided registration to attend that day to receive their award, as well as $600 and a year’s membership in SWCS. A review of the Chapter’s A.D. Latornell Award of Merit Program was undertaken last year and it was decided to discontinue the professional (non-student) award in order to sustain the award and focus on young people in the field, whom Art took a particular interest in mentoring and developing. Additional changes may be considered for next year. If you are interested in setting the future direction for the award or in helping evaluate this year’s applications please contact Award Committee Chair, Pamela Joosse at pamjoosse@gmail.com. Please help promote the award to make sure those worthy of Art’s legacy are considered. The 70th Annual SWCS Conference will be held 26-29 July 2015 in Greensboro, North Carolina. Full details are on the SWCS website. The theme is “Coming Home to Conservation: Putting Science into Practice”. This is an excellent conference for anyone interested in soils and water management. This year’s program looks particularly interesting including the different additional workshops you could attend. One way the SWCS is moving forward on current environmental challenges is by incorporating the former National Institute of Food and Agriculture (NIFA) National Water Conference into the International Annual Conference, which will increase collaborative opportunities for land-grant based scientists and educators engaged in water issues. SWCS welcomes this addition to the already diverse audience and the enhancement it will provide to all conference participants. Our very own board members will be giving presentations too. Jacqui Empson Laporte who works at the Ontario Ministry of Agriculture Food and Rural Affairs will present “Putting Technology to Work Leading to Real-Life Solutions: Aquahacking”. Management Improvements in the Canadian Lake Erie Basin”. Visit the SWCS.org website to see more details. The programme looks very interesting. Hope you can attend!